A study carried out by the French ManpowerGroup has identified three emerging job profiles for the future: the Protector, the Optimizer and the Storyteller. The latter one, the Storyteller, is described as a “craftsman of engagement”. He or she gives meaning to (or renews) the company’s engagement in times of crisis and communicates with all stakeholders through dialog and social media. In today’s organizations we often find these creative people in marketing and communications functions such as “Content Marketer”, “Digital Brand Manager” or “Community Manager” and in business supporting roles, including “Innovation Valorization Managers”, “Business Evangelists” and “Cultural Engineering Consultants”. 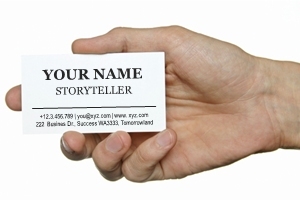 Although I have met only very few people with “Corporate Storyteller” on their business card, storytelling is becoming the new gospel of business. And those creatives who can create compelling stories, get their message across, and inspire audiences’ passion will stand out in the new era of content and meaning.